Halloween is high on every stoner’s list of fave holidays — after 4-20 and just ahead of 4th of July (fireworks!). And really, what’s not to love about a day dedicated to candy and dressing like a fool? 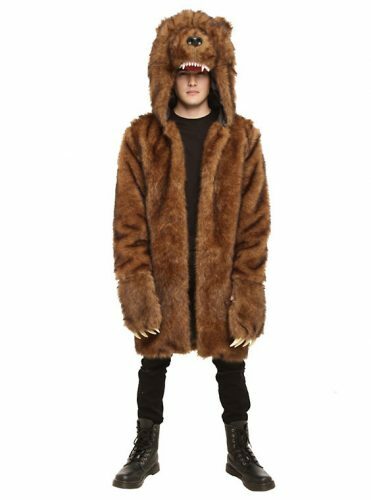 Workaholics Official Bear Jacket, available at www.hottopic.com. With the exception of this curly long-hair wig, this is a DIY effort. But if you want to take your Blake Henderson game to the next level, pop into Hot Topic and pick up the official Workaholics Bear Jacket. Because we know you’ve been looking for an excuse to shop at Hot Topic. Keep it simple with this international symbol of cannabis. Of course, you also run the risk that you won’t be the only leaf at the party, which could prompt a smoke-off — which, actually, doesn’t sound all that bad. Cannaboss Suit available at www.amazon.com. Man bun not included. 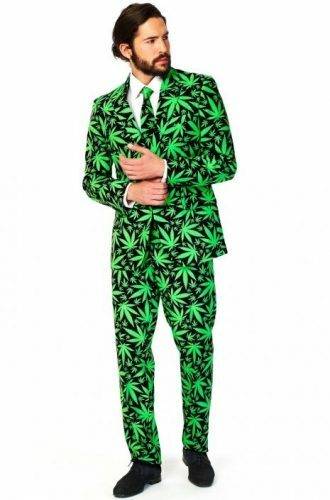 Upgrade your formal wardrobe with this 100 percent polyester weed-leaf suit that’s so much more than a Halloween costume. So long as you don’t spill bong water on it, you’re clear to make a fashion statement by wearing this suit to weddings, fancy restaurants, and — of course — the office. Here’s another chance to be have a cool stoner costume that doubles as a trendy outfit for the rest of the fall. That is, unless you go the distance in Ilana’s goth football ensemble (white football jersey + black bike shorts). Yas Kween! A more comfortable option would be to go as season-one Abbi with this “Cleaner” t-shirt and some yoga pants. 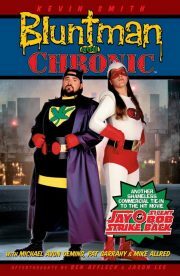 Rock the party as Bluntman and Chronic. The legacy of Kevin Smith’s affable characters from Chasing Amy and Jay and Silent Bob Strike Back will live on forever in Stonerdom. This isn’t a total DIY project — you can pick up the Bluntman t-shirt and baseball hat on Amazon. Add your Jay and Silent Bob wigs, and your good to go, snoochie boochies! Big Ol’ Bag of Weed costume available at www.halloween-mall.com. Bonus: Where it’s legal, you can stuff this costume with real weed and make a lot of friends. Start growing your mustache now and be prepared for shenanigans. This costume is both a throwback and ahead of the curve, because the sequel to the 2001 hit film hits theaters 4/20 2018. Meow! Totally Baked Potato available at www.trendyhalloween.com. This costume is for the boomers. Just be prepared for a Millennial to mistake you for the Super Mario Brothers. Did we forget any other good weed-centric costumes? Show us your Halloween stoner style on Facebook and Instagram by tagging your posts #HalloWeed.